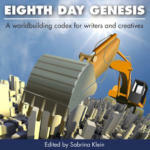 You might remember that Eighth Day Genesis, edited by Sabrina Klein, is nominated for an Origins award this year! You’ll be able to check the book out from Lending Library at the Origins Game Fair in order to review it, but I also hope you’ll consider purchasing a copy of the paperback or ebook editions from Amazon.com or directly from the publisher (me), Alliteration Ink. All of the contributing authors participated on a royalty-share basis, so they share a percentage payment from each sale. Origins, I will be in you!